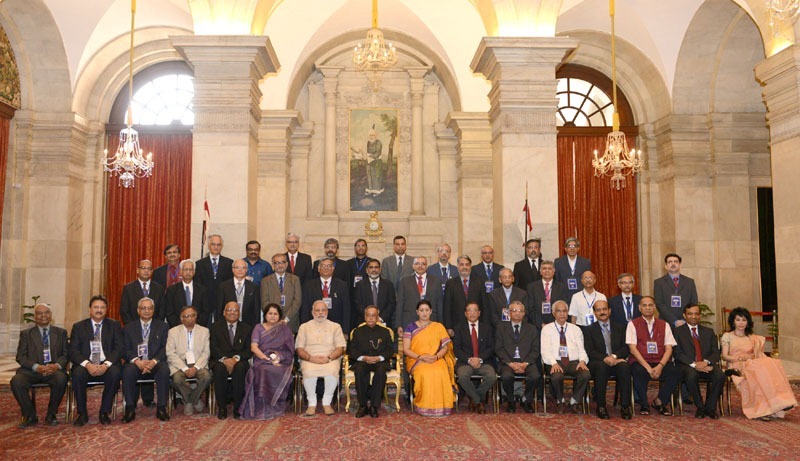 The President of India, Shri Pranab Mukherjee inaugurated a one day conference of Chairmen, Board of Governors and Directors of Indian Institutes of Technology (IITs) at Rashtrapati Bhavan today (August 22, 2014). Speaking on the occasion, the President described IITs as knowledge leaders of the nation and urged them to explore how quality of education can be improved. He said there is need for soul searching on what is holding back good governance in institutes of higher learning. If our institutes of higher learning are to compete with the best in the world, governance of these institutes must be comparable to the best in the world. He called upon the Council of IIT’s to draw up a roadmap for governance in line with the best global practices and implement it without any delay. The President said in spite of our technical capabilities to put the satellites of other countries into space, we are still importing technology starting from security features and papers for Indian currency to defence equipment. We need to see how the technologies developed by IIT’s and future research in IIT’s can be used to meet the technology requirements of the nation. So far we have been giving attention to industry-academia inter-linkages, but now we also must focus on government-academia inter-linkages. The Council of IIT’s should focus on how IIT’s can become a source for meeting technology needs of government and become a harbinger of the vision – ‘Make in India’ and ‘Made in India’. The President said the structure of a good educational system rests on four pillars—values, teachers, students and infrastructure. There is no dearth of talent in our faculty or students. Constraints such as huge shortage of faculty should be urgently addressed. The vacancy position in IIT’s varies from 10% to 52%, and the overall vacancy in 16 IIT’s is over 37%. There is need to attach importance to the ranking process. This process provides a reality check and an opportunity to introspect and position the institute on a global map. The President said alumni of IIT’s should be engaged in the governance structure to tap their skills, global reach and mobility. He called upon the Council of IIT’s to create an enabling framework for participation of the alumni in the governance of these institutions. The President called upon engineering institutions like IIT’s to work towards making the Science, Technology and Innovation (STI) policy a success. He also said strong linkages should be built between Innovation Clubs of Central Universities, NITs and IIT’s to promote innovation and development. The President said India’s biggest strength in the coming years is going be her demographic dividend. This offers us a unique opportunity to become a global supplier of skilled manpower. For this we must achieve our target of skilling 500 million people by 2022. In this context, converging all skill related initiatives into the Ministry of Skill Development is a welcome step and should help us to focus on creating a “Skilled India”. ICT programmes functioning in silos should be converged to build a Digital India. This ‘Network Grid’ should link up with the ‘Skill Grid’ being created by the Ministry of Skill Development. The President invited all IITs to participate in a week-long “Festival of Innovation” which the Rashtrapati Bhavan proposes to organize in March 2015. The Prime Minister and Union Minister of Human Resource Development also addressed the conference.